Scientists have paired NASA’s Cassini spacecraft with the National Science Foundation’s Very Long Baseline Array (VLBA) radio-telescope system to pinpoint the position of Saturn and its family of moons to within about 2 miles (4 kilometres). The measurement is some 50 times more precise than those provided by ground-based optical telescopes. The feat improves astronomers’ knowledge of Saturn’s orbit and benefits spacecraft navigation and basic physics research. The team of researchers used the VLBA — a giant array of radio-telescope antennas spread from Hawaii to the Virgin Islands — to pinpoint the position of Cassini as it orbited Saturn over the past decade by receiving the signal from the spacecraft’s radio transmitter. They combined this data with information about Cassini’s orbit from NASA’s Deep Space Network. The combined observations allowed the scientists to make the most accurate determinations yet of the position of the center of mass, or barycenter, of Saturn and its numerous moons. The study team included researchers from NASA’s Jet Propulsion Laboratory in Pasadena, California, and the National Radio Astronomy Observatory (NRAO) in Socorro, New Mexico. 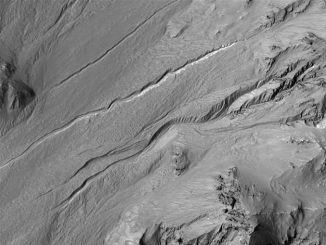 The scientists presented the results of their work on 8th January at the American Astronomical Society’s meeting in Seattle. The new measurement was made possible by two factors: Cassini’s long-term presence in the Saturn system and the VLBA’s ability to discern extremely fine detail. The result is a greatly improved table of predicted positions of objects in the Saturn system, known as an ephemeris. An ephemeris is one of the basic tools of astronomy. “This work is a great step toward tying together our understanding of the orbits of the outer planets of our Solar System and those of the inner planets,” said Dayton Jones of JPL, who led the study. The improved positional information will help enhance precise navigation of interplanetary spacecraft and help refine measurements of the masses of Solar System objects. It will also improve predictions of when Saturn or its rings will pass in front of background stars — events that provide a variety of research opportunities for astronomers. VLBA measurements of Cassini’s position have even helped scientists who seek to make ever-more-stringent tests of Albert Einstein’s theory of general relativity by observing small changes in the apparent positions of actively feeding black holes, or quasars, as Saturn appears to pass in front of them on the sky. Cassini’s navigation team, charged with plotting the spacecraft’s course around Saturn, began using new positional information provided by the ongoing study in 2013. The new ephemeris has enabled them to design better manoeuvres for the spacecraft, leading to mission-enhancing savings in propellant. Previously, the navigators performed their own estimates of the positions of Saturn and its satellites using data gleaned by tracking Cassini’s radio signal during its communications with Earth. The new calculations, enhanced by VLBA data, are about 20 times more accurate. Jones and colleagues plan to continue the joint observations with Cassini and the VLBA through the end of Cassini’s mission in late 2017. 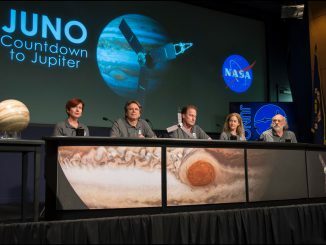 The team plans to use similar techniques to observe the motion of NASA’s Juno spacecraft when it reaches Jupiter in mid-2016. They hope to improve the orbital knowledge of that giant planet as well. 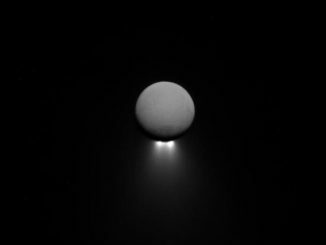 Enceladus’ intriguing south-polar jets are viewed by the Cassini probe from afar, backlit by sunlight while the moon itself glows softly in reflected Saturn-shine.